The Cumberland & Dumfriesshire Farmers Mart P.L.C. 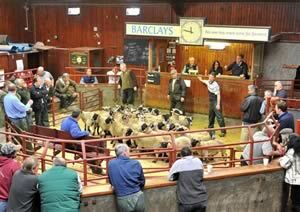 had forward 65 prime cattle, 0 young bulls, 24 over thirty month cattle, 5,276 prime lambs and 5,035 cast ewes & rams at their weekly sale at Longtown on Thursday 26th August, 2010. A larger show of prime cattle saw trade sharper on the week. Charolais heifers to 171.5p from J. & N. Blaylock & Son, Hallburn, purchased by M. Wharton, Butchers, Wigton, others 165.5p Hallburn, 157.5p Upper Mains; Limousin 169.5p, 162.5p Hallburn, 155.5p Becton Hall. Bullocks to 170.5p for Limousin from Sceughdyke, others 169.5p Dashwell Green, 163.5p Bleatarn, 162.5p Dashwell Green and Newby Farm. Charolais heifers to £1,063.30, £984.73 Hallburn, £975.80 Upper Mains; Limousin £983.10 Hallburn £964.10 Becton Hall. Charolais bullocks £1,148.78 Sceughdyke, £1,069.45 Becton Hall; Limousin £1,099.73 Sceughdyke, £1,065.18 Dashwell Green. A plainer show of cows on offer was met by a brisk trade. Top price of 115.5p (£1,108) for a Simmental bullock from T. Armstrong & Sons, Sceughdyke. Limousin cows to 104.5p Low Todholes, 99.5p Parkside, 95.5p Low Todholes, 94.5p High Greenhill, 93.5p Nunscleugh; Friesian 89.5p, 81.5p Brisco Hill; Ayrshire 87.5p Brisco Hill. A larger show of 5,276 prime lambs was forward with trade being the best of the week, all kinds in demand to average 171p. Top per kilo of 196.2p per kilo for Beltex from Sorbie and to £102.50 per head for Texels from Kirkton, others £86.80 Upper Mains, £86.50 Nunscleugh; Beltex £87.50 Bankhead, £81.80 Sorbie, £76.50 Balgray; Suffolk £86.20 Cowburnrigg, £85.80 Upper Mains, £84.50 Hallburn; Greyface £74.80 Hallburn, £74.50, £73.50 Harelawhill; Cheviot Mule £74.80 Sharplaw; Charollais £74.50 Caberston, £73.80 Roanstree, £70.80 Wyseby Hill Cottage; Hill Cheviot £66.80 Glenkiln; Romney Marsh £64.80 Farmers Close; Leicester £64.50 The Flatt; Oxford £62.50 Sandholm; Blackface £61.80 Milnmark, £60 Plumpe; Swaledale £60 Mid Murthat. The 800 lightweight lambs were short of requirements and sold to a top of £67.50 for Bleu d’Main from Ridley Stokoe; Suffolk £65.80 Murtholm; Texel £65.20 Borthwick Brae, £64.80 Scarlett Hall; Beltex £64.80 Solway Bank; Hill Cheviot £64.20 Commonside; Blackface £60.50 Milnmark, £59.80 Caberston; Greyface £59.80 Williamwood, £57.80 Scarlett Hall; Swaledale £54.80 Foul Lonning, £51.20 High Edges Green. A similar entry of 5,035 cast ewes and rams attracted the usual buyers, with trade easier on the week but sheep still easily sold. Top price of £122 for a Texel ram from The Pool, others £108.50 Round Meadows; Suffolk £120.50 Hillside, £119.50 Severs; Charollais £120.50 Roadside; Beltex £116.50 Howgillside; Leicester £102.50 Morley Hill; Hill Cheviot £94.50 Newbigging, £78.50 Whitefield; North Country Cheviot £82.50 Seavers; Swaledale £66.50 Morley Hill and Round Meadows; Blackface £66.50 Newbigging; Ryeland £60.50 Bonnyrigg Hall; Jacob £54.50 Bonnyrigg Hall. Heavy ewes to £118.50 for Texels from Newbigging, £116.50, £110.50 Roadside; Suffolk £100.50 Seavers, £97.50 Severs; Beltex £97.50, £96.50 Church Road; Leicester £92.50 Nether Stenries, £90.50 Bluebell; Charollais £90.50 Roadside, £88.50 Seavers; North Country Cheviot £90 Whitchesters, £89.50 Roadside; Greyface £87.50 Hermitage, £84.50 Westside, £79.50 Glanafon; Cheviot Mule £87.50 Mossband House, £84.50 Barnglies; Half Bred £83.50 Bluebell, £68.50 Earlside; Zwartbles £73.50 Newbigging; Oxford £72.50 Bluebell; Dorset £58.50 Dunnabie. Hill ewes to £75.50 for Lleyns from Pilmuir, £74.50 Whitcastles; Hill Cheviot £70.50 North House, £68.50 Chapel Farm; Blackface £66.50 Roughet Hill, £63.50 Red House; Jacob £62.50 Stackbraes; Swaledale £59.50 Beamwham, £56.50 Nunscleugh, £53.50 Stonehall; Herdwick £41.50 Butterdales, £37.50 Common House.